You don't have to spend much time on our site to realize that the well of our love for bees runs deep. Extending far beyond the sororities of European honey-producing hymenopterans, one of our primary goals is to help our community create environments that support all bees! One of the best ways to do this is to provide nesting sites for them. Luckily, many bee species make this easy, and setting up nests for solitary, tunnel-nesting bees is a safe and inexpensive way to make a positive impact in your local ecosystem. Solitary, tunnel-nesting bees make up about 30% of North America’s 4,000+ native bee species. Most bees in this category come from the family Megachilidae. This family includes commonly-known tunnel-nesting bees like the blue orchard mason bee (Osmia lignaria) and the alfalfa leafcutting bee (Megachile rotundata). All of the above result in declining bee populations. To top it off, these native bees are the most effective at pollinating our edible gardens and fruit trees, so when they decline... our fruit yields do, too. Are you interested in helping these furry flying friends while simultaneously helping your garden? We’ve got you covered. In the following sections of this post, we will detail how to set up your very own solitary-tunnel-nesting bee house. Bee houses are readily available at various bee supply or garden stores, but they are also fun and easy to DIY. Our favorite containers to convert into bee homes are Trader Joe’s coffee cans. They are the perfect size to fit nesting tubes into and are fun to decorate with paint, paper mache, and lacquer. You can even hot glue fun buttons and tiles on, as well. Different bees have different preferences for tube diameters based on their body size. Blue orchard mason bees have a known diameter preference for 8mm, and alfalfa leafcutting bees prefer 6mm tubes. To accommodate a greater range of bee species with unknown preferences, provide a mix of tube sizes in your house. Cardboard tubes and natural reeds are the most commonly used and sold nesting option. Cardboard tubes are hygienic, can be purchased in a variety of diameters, and are easy to unravel if you choose to harvest your cocoons. Blue orchard mason bees nesting in cardboard tubes. Natural reeds are often the preferred choice of mason bees. They vary naturally in diameter and surface texture which can help the bees recognize their specific nest site. Reeds are harvested most commonly from wetland grasses in the Phragmites genus. These reeds grow wild across the US and can be harvested, dried and cut to size. Other plants species with hollow woody stems can be used in place of reeds. Bamboo is sometimes used but is often too difficult to open for cocoon harvest so it is not an ideal nesting material. The most commonly available reeds are larger diameter, which would be appropriate for most mason bees. Smaller diameter reeds are sometimes available and would be a great option for leafcutter bees and other smaller species of tunnel nesting bees. Nesting blocks are either drilled holes in blocks, or trays that can be separated during cocoon harvest time. They can be purchased in various diameters to accommodate different species. They are probably the easiest of the options to separate during harvest and have the added benefit of being reusable year after year (with cleaning in between of course!). One of the most helpful things you can do for your new solitary bee friends is to provide them with landmarks within the bee house to help them locate their specific nesting tunnel. Intersperse items like bundles of sticks, pinecones, grasses, or any natural material in the enclosure with your tubes. If you build it, they will come... usually. If you have met their habitat requirements, there is a good chance you will attract wild bees without any additional effort! To increase your chances, you can purchase cocoons from local garden stores or online web stores. Leafcutting bee cocoons are sold in the summer (most commonly the alfalfa leafcutting bee). Place cocoons above the tubes and below the roof of your bee house. If your bee house has an “attic” space, you should place your cocoons there to shelter them from birds and other predators. After one to three days, if temperatures are consistently above 55 degrees during the day, your bees should emerge and colonize the tubes. Don’t worry about buying cocoons to occupy all your tubes - a small group will kickstart your population. Other tunnel nesting bees will be attracted to your house from the smell of the cocoon fragments and nesting pheromones! There are many species of solitary, tunnel-nesting bees around, and it's always fun to see who moves in. Many of these are different species of mason and leafcutting bees, and most are native to North America. Help scientists learn what bees are nesting where by signing up for a program like the Native Bee Network with Crown Bees. Not all tunnel-nesting bees are native, though. 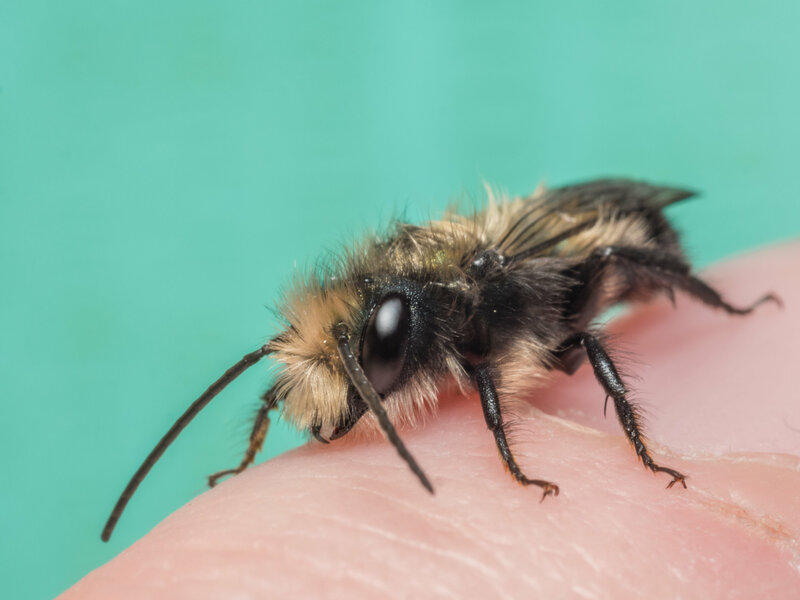 The most common of these to colonizing garden bee houses is the “horn-faced bee” (Osmia cornifrons), which is native to Northern Asia. We aren’t strangers to homing non-native species, but be sure to provide ample nesting tubes to compensate for any competition for those resources the non-native varieties are using. Leafcutting bee ( Megachile frigida ) foraging on a sunflower. Raising solitary, tunnel-nesting bees is an easy, inexpensive, safe, and low-maintenance way to support food and seed production in your local ecosystem. Just setting up the habitats and letting the bees go is often enough to make a sizeable impact. Many, however, take it even further, harvesting and cleaning cocoons for safe overwintering, or by submitting observational data to native bee population surveys. If this is something you’re interested in, stay tuned for further posts as the season progresses!